Chana Alexander (left) taught Hands-Only CPR at the MLK Day of Service in Lancaster this past January. 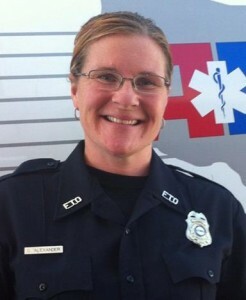 LANCASTER – Chana Alexander, a paramedic with American Medical Response in Lancaster, is one of 23 Californians who will be honored for heroic acts and extraordinary contributions to EMS on December 4 in San Francisco. Alexander will receive the Community Service Award at the 2013 California EMS Award Ceremony on December 4 at the Marines’ Memorial Hotel in San Francisco. Launched in 2007, the annual awards honor and recognize exceptional acts and service by individuals working or volunteering in California’s emergency medical system. Alexander is being recognized for her efforts at introducing Hands-Only CPR to the local community. 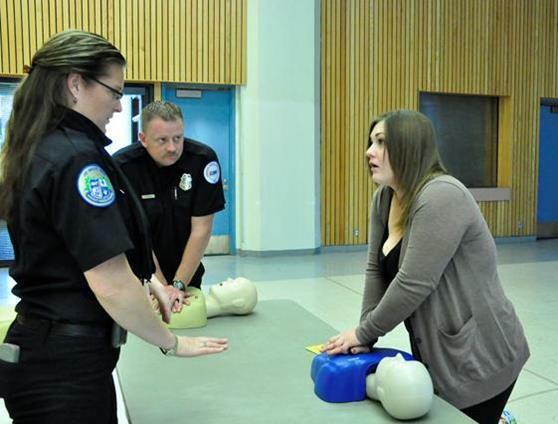 Hands-Only CPR, which requires no mouth-to-mouth contact as standard resuscitation efforts have in the past, has gained popularity in recent years. In four months, Alexander trained more than 1,000 residents of the Antelope Valley in this vital life-saving technique. Once a week, she volunteers at Poncitlan Square in Palmdale to teach this technique. Alexander’s goal is to share this important information with every resident (well over 155,000 people) in the Antelope Valley. EMS awards are intended to honor and recognize noteworthy or exceptional acts and service by EMS certified or licensed personnel, administrators, trainers, or volunteers within the EMS system. The award period represents activities from September 8, 2012 through September 6, 2013 for cumulative service. View all 23 EMS Awards Recipients for 2013 at http://www.emsa.ca.gov/2013_EMS_Award_Recipients. 16 comments for "Local paramedic to receive statewide recognition"
We are friends of Jack and Diane. We live in RI and spend a good deal of time with them when they visit each summer. We want to congratulate you on your award. As you know you are the most important person in the field. You are the bridge between life and death. I am so impressed and keep up the good work. The real Jack and Diane, or the Jack and Diane from the John Mellencamp song? Awesome award for someone with good work ethic and sense of pride in her job. Good work. It’s great to hear about a young person who exceeds expectations and is recognized by someone outside the community. Someone who can not be bought. Congratulations Chana, I always knew you were very special, now everyone in your town knows what we always knew about you. You should come to RI and teach all of us here. Keep up the good work honey. Chana…. Wow!! So very proud of you! Awesome recognition to a wonderful and hard-working girl!! Congratulations and thank you!!!! Congratulations Chana!!! What a wonderful recognitions! With your special spirit that is so giving you touch and make better all the lives you come in contact with. Your family has a lot to be proud of. Congrats! I think its time we recognized paramedic’s out here in AV and pay them higher living wages just as we do with firefighters somehow. Like they did in the City of LA what do you think Palmdale, Lancaster, LA County? Congratulations Chana. I am so happy for your recognition. You really deserve it. You are an inspiration. I am very proud to have you as a coworker and friend. Great job. I’m so proud of you and its great that you get the recognition you deserve. Keep up the good work. The community needs great people like you, to educate them. So so proud. Good job. You were good in band and are good with what you are doing now. Kept me from worrying to much when I rode with you. Come back in and see me. I think all of you band kids are really special. Chana, words alone cannot describe how proud I am of you and all your accomplishments. You are an amazing woman, wife, mother and daughter. This community is lucky to have someone who continues to give back life saving lessons on a day to day basis. Way to go Chana!! So proud of you and all you do! Congratulations Chana !! .. keep up the good work..